The Wright Wreport: 'Rx' Isn't a Placebo. It'll Result in Genuine Laughter. 'Rx' Isn't a Placebo. It'll Result in Genuine Laughter. Meena (Marin Hinkle) and Paul(Stephen Kunken) are in search of the right prescription for happiness in "Rx." Photos by James Leynse. In Kate Fodor’s new comedy, “Rx,” it appears that Big Pharma has a prescription for all of life’s tribulations. 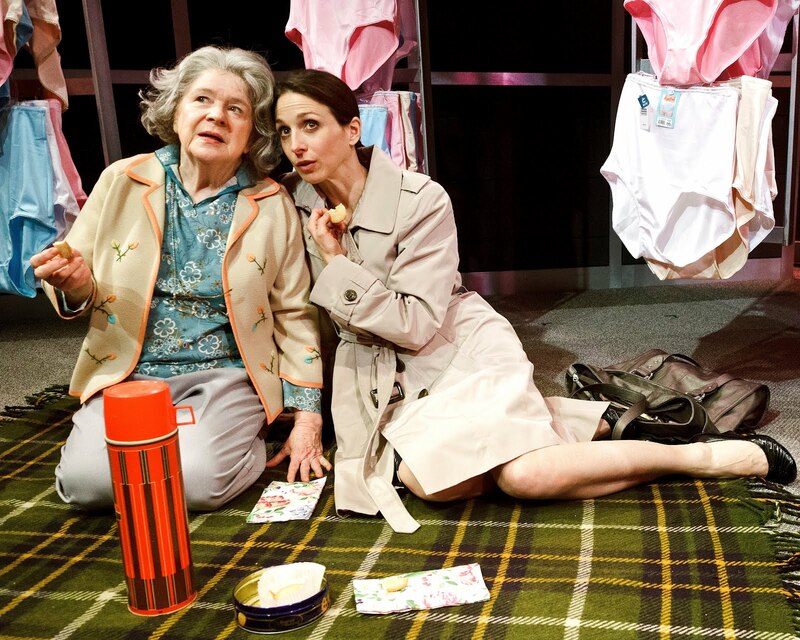 The Primary Stages production is at 59E59 Theaters through 3 March. Meena Pierotti (Marin Hinkle), a published poet, is miserable being Managing Editor at “Piggeries, American Cattle & Swine Magazine.” She is the perfect candidate for a clinical trial of a drug being developed by the pharmaceutical company, Schmidt Pharma. The drug is designed to relieve work-related depression. Just ask Meena's boyfriend, Dr. Phil Gray (Stephen Kunken), who doubles as the drug’s target consumer and a Schmidt researcher. He earns upward of $65,000 and has health coverage, he informs her. Phil’s boss, Allison (Elizabeth Rich), is thrilled with her job and the rich market potential job dissatisfaction presents. Could Frances (Marylouise Burke), a cheerful widow Meena meets in the old ladies’ underwear section of a department store be a part of the clinical trial? To Meena’s surprise, Frances discloses that she really missed her menial factory job when she got married. Frances (Marylouise Burke) shares her worldview with Meena (Marin Hinkle) in "Rx." The cast under Ethan McSweeny’s excellent direction gives KF’s witty and entertaining script its due. To help keep up the comic pace, Lee Savage cleverly uses modular variations on the Murphy bed in the fluid set design. Giving the satire in “Rx” a little extra bite are MH and SK, both Tony nominated for “Enron.” They give affecting naturalistic performances as the romantic leads. In one of two roles, Paul Niebanck, gives a broad, almost slapstick turn as Morgan, a bumbling research doctor in Schmidt’s lab.